– for the detection of human exposure of anomalistic terrestrial radiation, including electromagnetic in the so-called geopathic zones, for example, in terms of hospital beds, planning of jobs, in the construction of residential houses. -to fix the boundaries technopathogenic of human exposure of computer equipment and other electronic devices and test the effectiveness of protective devices. -measurement of the aura for health diagnosis and examination of various influences on human as psycho-physical, psychotropic drugs, bioenergetic amplifiers and protective devices. -underground exploration of metallic and nonmetallic pipelines, voids, water lived graves. The device of the YOKE-1(Fig.1) contains the sensor in the form of a receiving antenna 1, made in the form of a conductive plate round, square or other shape in plan and are electrically small compared to the wavelengths of the operating frequency band; external integrator 2, the input of which is connected with antenna 1, and the integrator 2 includes a preamplifier 3, the first inverting input which is the input of the integrator 2, the pulse filter 4, a first input connected to the output of the preliminary amplifier 3, the reference oscillator 5, the output of which is coupled to the second input of the pulse filter 4, the AC amplifier 6, the input of which is connected to the output of the pulse filter 4, the phase detector 7, a first input connected to the output of the AC amplifier 6 and the second input connected to the output of the generator 5, internal integrator 8, a first inverting input connected to the output of the phase detector 7, the correction unit 9 noise background, the output of which is coupled to the second input of the internal integrator 8, the first feedback loop including the control unit 10 of the task of the feedback factor, the input of which is connected to the output of the integrator 8 and the output with a second non-inverting input of the preliminary amplifier 3, a DC amplifier (UPT) 11, inverting input connected to the output of the integrator 8 and a second feedback loop that includes the differential-intiraymi unit 12 and a nonlinear element 13 of the “dead zone”, connected in series, the input of the differentiating unit 12 connected to the output terminal 11, and the output of the nonlinear element 13 is connected with the third inverting input of the preliminary amplifier 3, the output of the DC amplifier 11 is the output of the integrator 2; in addition, the device contains a button 14 of the external integrator reset 2 connected to the second input of the differentiating unit 12 and closing the circuit when pressed, the capacity of the block 12, which is the cumulative capacity of the external integrator 2; a low-pass filter 15, the input of which is connected to the output external integrator 2, i.e., with the output terminal 11 and display element 16, for example, switch type, the input of which is connected to the output of the filter 15. Device IGA-1 allows protection of living organisms by determining the localization of abnormal discontinuities of the electromagnetic field in the space above the investigated surface, determine the configuration of their exact boundaries for the corresponding redistribution of protected living organisms (or their places of permanent or frequent stay ). Identify dangerous locations in a spatial field pattern over the study area and redistribution of protected objects reliably ensures their protection from harmful influence of the electromagnetic component and other components of nature. Since it is known that in geopathogenic zones has a matching topology overlay anomalies fields of different nature (magnetic, electromagnetic radio-frequency range, the ultraviolet range, high radioactivity, climatic anomalies and, perhaps, as yet unknown nature, that the most radical defense is to choose a safe location for one of the simply register the components of the radiation with the help of the device IGA-1. The device of the YOKE-1 (Fig.1) works as follows. The receiving antenna 1 a is parallel to the sample surface at the appropriate height level, whereby the antenna 1 forms a capacitance with the test surface and is one of the plates. As a result of application of the antenna 1 with an ultra-small electrical size, i.e. antenna, whose geometrical dimensions are negligibly small compared to the size of its wavelength selective amplification at any particular operating frequency does not occur, therefore this antenna is broadband and takes all noise signals as a useful signal. The noise signal from the antenna 1 is supplied to the input of integrator 2, working in the result of the capacitive nature of the antenna 1, the integrator input current, i.e., as a charge amplifier antenna 1. After amplification of the noise signal in the preliminary amplifier 3, a first input which is the input of the integrator 2, the amplified signal passes through narrow band pulse filter 4 with a bandwidth of a fraction of a Hertz, where the selection of the frequency component of the noise signal at the frequency of the pulse voltage generated by the generator 5 with the possibility of adjustment. After amplification of the signal of the AC amplifier 6 amplified signal frequency component of the noise is supplied to a first input of the phase detector 7, the output of which is proportional to the magnitude rank of the phase difference between the reference signal generator 5 and allocated frequencies-tion component of the signal received by the antenna 1, i.e. the noise signal. Further, the signal phase difference is fed to the input (inverting) integrator 8 , to the inverting input of which receives the voltage correction of background interference from the output of the correction unit 9. The resulting signal from the output of the internal integrator 8, weakened in block 10 of the task of the feedback factor, which is a voltage divider, is input (the second non-inverting) pre-amplifier 3, which is subtracted from input signal noise. Thus, by covering the second inner integrator 8 feedback loop, the whole path from the entrance of the pre-amplifier 3 to the output of the integrator 8 operates as a smoothing low-pass filter necessary for smoothing the output of the phase detector 7 and to improve the accuracy of converting the magnitude of the phase shift at a constant voltage. The magnitude of the transmission coefficient of the unit 10 in the feedback loop also sets the gain of the specified tract. The smoothed voltage proportional to the phase difference is further amplified by the DC amplifier 11 and through a differentiator 12, which is the capacitive feedback and responsive to change of this voltage and the nonlinear element 13 is supplied to the third inverting input of the preliminary amplifier 3, where it is subtracted from the voltage noise. Thus, after working the placement of an antenna 1 fixedly parallel to the sample surface, the phase of the oscillation generator 5 and the selected pulse filter 4 a frequency component equal in frequency to the oscillation generator 5 are usually not equal, causing the output of the phase detector 7 occurs the voltage which the averaging integrator 8 with the first feedback loop through the unit 10, provides a voltage level which is proportional to the phase shift. This phase shift is taken over interfering background and kompensiruet viscitudes of the voltage from the output of block 9 of the correction, which adjust to the amount of full compensation to the output of the integrator 8, the voltage is equal to zero. Then reset the integrator 2 button 14, shorting the capacitance of the differentiator 12, causing the voltage at the output of low pass filter 15 and, accordingly, the indicator 16 is equal to zero. Then start working the movement of the antenna 1 in the search direction parallel to the surface at a constant speed. In this case, when entry of the antenna 1 in the area of electromagnetic anomalies is the appearance of the increment of the phase difference relative to the value received for the interference level, resulting in the imbalance of the integrator 8 and the appearance at its output a voltage proportional to the increment of the phase difference. This voltage is amplified by an amplifier 11 and supplied to the blocks of the second feedback loops 12 and 13. In the case where the increment of the phase difference at the output terminal 11 is small and does not exceed the dead zone of the nonlinear element 13, for example, in the case of natural spatial fluctuations of the field that is interfering, or on the boundary of the magnetic anomalies, the second feedback loop is open, resulting in only works with direct path antenna 1, the indicator 16, the integrator 2 is turned off and not integrate, and the voltage output from the DC amplifier 11 is fed through a filter 15 directly to the indicator 16, the fluctuations of the arrow being proportional to the instantaneous phase increments of. These deflection of the indicator 16 are reversible, if you return the antenna 1 back to its original place. In the case of entering into the zone of electromagnetic anomaly, the magnitude of the phase difference between the selected frequency component from the output of the pulse filter 4 and the oscillation output of the reference oscillator 5 increases, which leads to an increase in area of pulses at the output of the phase detector 7 and increasing the voltage level at the output of the integrator 8, is proportional to the phase shift. As a result, these changes are transmitted through the differentiator 12 and if the voltage on the output exceeds the area necev-steelnet element 13, the loop (second) feedback, consisting of differentiator 12 and the element 13 is closed, resulting in the inclusion of external integrator 2 and he begins to integrate the selected phase difference. In this case, if the phase difference does not disappear, the output terminal 11 is observed increasing the signal until the value of the saturation voltage DC amplifier 11, this voltage is received through filter 15 that filters out voltage spikes transients at the input of the indicator 16 and displayed. Thus, quite arbitrarily small value of the phase difference exceeding the dead zone of the nonlinear element 13, to cause deflection (rotation) indicator needle 16 to the limit, and the speed of this deviation is proportional to the phase difference minus a constant value of the dead zone. Stop indicator needle 16 in any position means the disappearance of the phase difference (output from the abnormal area), and a decrease of the indicator 16 corresponds to the change of sign of the phase difference. Unit readings can be taken one deflection (rotation) indicator needle 16 to the end of the timeline (similar to turning radiocatalysis vines) when driving with constant speed through the test section, measured in steps per rotation of the arrow in meters for one turn, or in seconds on a single turn (particularly with movement of the observer in the transport). Thus, the device allows to register and evaluate even the smallest deviations of the phase shift at two different spatial points. The implementation of the internal amplifier of the integrator 2 in the form of functional Converter, the voltage – phase that includes a direct path from pre-amplifier 3 to a terminal 11, allows you to unleash the input and output of the integrator 2 and implement in this regard a high gain, resulting in a higher sensitivity of the device in comparison with the known. When performing further measurements produce zeroing the integrating vessel 12 by closing its plates reset button 14. The choice of the value of the integrating capacitance of the integrator 2 in the block 12 is produced from the terms of the compromise between the value of the total gain (the smaller the capacity, the greater the gain) and a sufficiently large integration time for the purpose of convenience of registration (the larger the capacitance is, the larger the integration time). The scheme of the device IGA-1 is built on the classical radio and is radio receiver over weak fields in the range of 5-10 kHz, but the build(functional diagram) and not the usual shape and design of the antenna for a given frequency range, may allow you to record and torsion component, i.e. antenna IGA-1 is most likely a sensor of the torsion field. 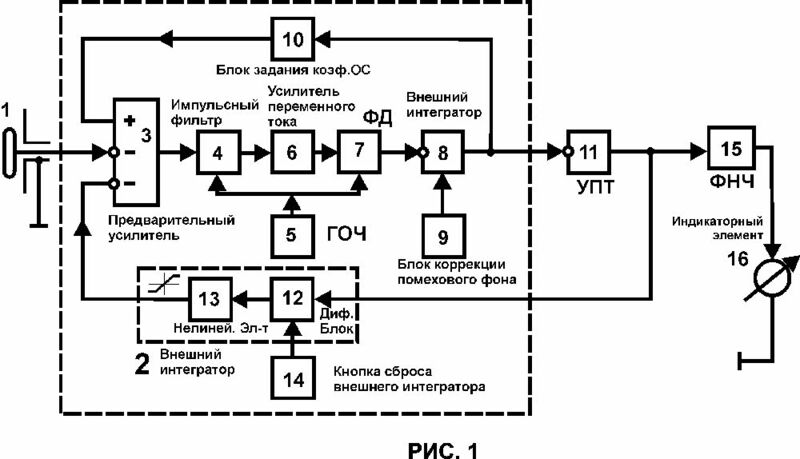 The device YOKE constructed according to the scheme of the radio (however, this scheme is not quite normal, in 50 years were regenerative receivers, then they replaced superheterodyne, ie close to it). We are 11 years produced a instrument YOKE 1 with an arrow indication for fixing of the boundaries of anomalies (GPP, technopathogenic the zone, the zone of influence of the pyramid, etc.). Then we asked the geologists to make the device IGA-1 in addition to the boundaries of the anomalies, and some numeric values to anomalies within the anomalies for correlation with other geophysical methods of research in identifying the tectonic processes, landslides, etc. Since 2005, we manufactured devices YOKE-1 for areas with additional digital display and modified previously issued instruments of IGA-1, used in geological survey organizations. These numerical values indicate the phase of the background radiation (internal parameter YOKE-1), and correlate with the intensity of the natural background of the Earth and its distortions. Thus, in addition to networking and anomalies in indoor visible numeric values in relative terms, as reference to set the absolute values of the numerical indicators we can not develop. It has found application in our customers instruments of the IGA-1 in the study of the influence of shungite, a variety of protective devices from the GPP, the charge water, the settings of the torsion generators, etc. Check the digital display and the biofield.